If you are looking to escape the busy schedule of your lives and slipping into a world filled with the richness of nature, then Sundarbans is the perfect place where you can chill comfortably under the open sky amidst seclusion. From dense evergreen forests to the perennially flowing waterbodies, there is a lot to explore and discover in and around the region of Sundarbans. Being a large forest in the region of Bay of Bengal, it is rich in aquatic as well as terrestrial life. On one hand, you can enjoy a cruise on the rich waters of Sundarbans and on another hand, you can confront the rich wildlife in its forests. So, why not plan a trip from Kolkata to Sundarbans this season? The region of Sundarbans has everything that you would want to witness. As the temperature during the summers is above the mean level, it is not advisable to visit Sundarbans during the summer season. However, the summer season is the best period to spot several migratory species of birds and numerous animals. If you are looking to roam around the forests and waters of Sundarbans comfortably in a pleasant weather, then the best time to visit Sundarbans is from September until the end of March. By Air: The nearest airport from Sundarbans is at Kolkata, which is at a distance of around 110 km. By Rail: There are no direct trains available to Sundarbans from Kolkata. However, you can catch a train from Kolkata to Canning and then from there you can hire a cab to Sundarbans. Canning is located at a distance of around 55 km from Sundarbans. By Road: Located at an approximate distance of 100 km from Kolkata, Sundarbans is accessible by road. 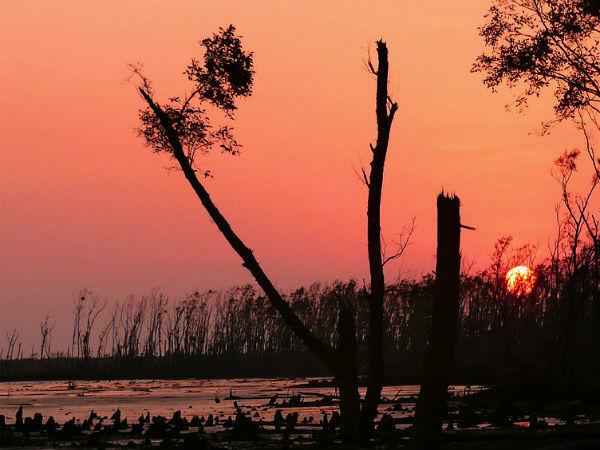 On your way to Sundarbans, you can take a break at Canning and explore its surroundings. Located at a distance of around 45 km from Kolkata, Canning is named after Lord Canning who was the governor general of India during the British period. You can also visit Lord Canning's Kuthi, his official residence. Even though the building is in ruined conditions, there is still a lot to explore in and around the residence. Canning is also famous for its fish supplying markets from where fishes in large quantities are supplied to Kolkata. Eventually, after covering a distance of 110 km, you will be on the lands of Sundarbans, a UNESCO World Heritage Site. The region of Sundarbans is a large forest which is spread over thousands of hectares. Being one of the richest coastal regions in the world, it is also considered as one of the natural wonders of the world. It is spread over several districts of West Bengal and Bangladesh as well. The area of Sundarbans is covered with large mangrove forests and swaps; hence, it is home to numerous rare and endangered species of animals, birds, plants and reptiles. It also covers the largest coastal mangrove forest in the world. Following are the major things to do once you are within the boundaries of Sundarbans. Sajnakhali Wildlife Sanctuary is located in the northern Sundarbans in the 24 South Parganas district of West Bengal. Being covered with mangroves and swaps, the area has rich wildlife. From species of waterfowl to species of spotted deer and tigers, you can spot hundreds of different rare and endangered species of animals and birds. The major species of birds found in this region include common iora, great egret and imperial green pigeon. Sajnakhali Wildlife Sanctuary is another tourist destination to capture the best of natural beauties. Sundarbans owns the largest coastal mangrove forest in the world. Hence, most of the area in Sundarbans is covered with mangrove forests. If you are looking to explore the beauty and alluring atmosphere of Sundarbans, then you must start your journey from these mangrove forests. It also has a rich wildlife habitat and therefore, you can spot several indigenous and migratory species of birds and animals in the region. From luxury cruises to standard boat trips, there are a lot of options available to witness the entire beauty of Sundarbans while floating on its rich waters. One cannot merely miss experiencing a day in the cruiser while in and around Sundarbans. If you are a wildlife lover, you are meant to discover its hidden beauty in the form of wild animals and green vegetation. The major animals found include Bengal tiger, Sundarbans tiger, chital, wild boars, flying foxes and spotted deer. With more than 250 species of birds and 100 species of reptiles, Sundarbans is definitely a natural wonder and assuredly deserves to be visited by every traveller and tourist.